The Minor League season is officially over, although a pair of teams in the Brewers farm system are headed for the postseason. With the end of the year comes our all-encompassing Farm Report. We'll break it down team by team, starting with the short season Helena Brewers. We'll start off with some obvious awards, and finish with a five up, five down section. Five prospects who raised their stock, and five who lowered theirs. 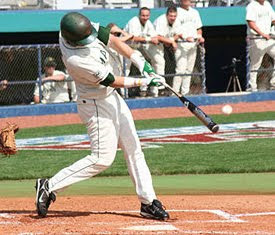 Best Base stealer: Joshua Prince - SS - Prince swiped 26 bases in 36 games before being called up to Low Class A Wisconsin. Most Power: Scott Krieger - RF - Epitomizing the all or nothing hitter, Krieger(left) bashed 13 homers, which led the team and was good enough for fifth in the Pioneer League. He also struck out 94 times in 64 games. Best Plate Presence: Joshua Prince - SS - Let's just say his call-up to Wisconsin was well warranted. Prince led Helena in walks with 33, despite playing half as many games as his teammates. Extra Base Machine: Chris Ellington - LF - Ellington was second in homers (10), led the team in doubles (15) and was second in triples (2). Best Average: Sean Halton - 1B - I'm putting the number at 30 games to be eligible. 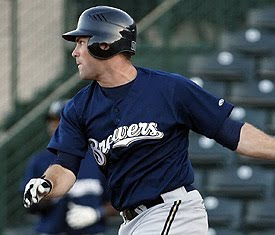 Halton hit .338 and played just 39 games after starting the season with the low Rookie Arizona Brewers. Best Command: Michael Fiers - RP - In the 21 innings he pitched for Helena, Fiers struck out 35 batters and walked only one. Needless to say he was promoted after that. Worst Defender: Tie - Joseph Paciorek - 3B - Cutter Dykstra - 2B - Both players were poor fielders for the Brewers, recording 18 errors apiece. Best Hitter: Chris Ellington - LF - Ellington hit .277 and had a well-rounded year. He led the team in Total Bases with 123, and was second in RBI's (42). Best Pitcher: Nicholas Bucci - SP - Bucci struck out 66 batters in 69.1 innings, leading the team. He also led the team in wins with six. Chris Ellington - LF - Ellington was drafted in the 32nd round this season. He is a college hitter and looked like it in the Pioneer League. He'll need to improve his on-base percentage (.314) if he wants to be a legit prospect but he definitely had a good first season. Sean Halton - 1B - Just a solid season for Halton(right). The 13th rounder hit .335 between Helena and Arizona. At 6'5" his power should continue to develop (he hit just six homers this year). Expect him to start next season at Wisconsin. Joshua Prince - SS - The self described "leadoff type" hitter, Prince provided just that. Between Helena and Class A Wisconsin, he hit .262 with 50 runs scored in 67 games. Most impressive though, is the .373 OBP and 38 steals. I see a full season with the Rattlers in his 2010. Michael Fiers - RP - Talk about a fast riser, after his 35:1 strikeouts to walks for Helena, Fiers was bumped to Wisconsin. At Wisconsin he struck out 8 in 6 innings and was promoted to Brevard County. For the year he struck out 59 batters and walked only five. It wouldn't be a surprise to see him at Huntsville (AA) next year. Nicholas Bucci - SP - Bucci had a solid year, posting six wins and striking out 66. While everyone talked about Jake Odorizzi, Bucci had a much better season. It'll be the Timber Rattlers for him in '10. Cutter Dykstra - 2B - Dykstra hit just .226 between Wisconsin and Helena. He also committed 19 errors. For a guy with his pedigree, the expectations will maintain. So far though, he's off to a disappointing start. Jake Odorizzi - SP - It's not that Odorizzi had a bad year, but he didn't have a good year either. For a guy drafted as high as he was (1A) last year, he needs to be better. Odorizzi had a pedestrian ERA (4.89) and WHIP (1.35). Damon Krestalude - SP - You can't read too much into rookie ball stats because they don't mean all that much. But Krestalude gave up an unacceptable WHIP (1.70) with Helena this season. He'll need to improve on that wherever he is assigned in 2010. Joey Paciorek - 3B - A 15th rounder in the 2007 draft, Paciorek has had trouble adjusting to major league game. A .231 average and 18 errors is testament to that. Seth Lintz - RP - Ok, so Lintz isn't on the Helena team, you've got me there. But since I'm not going to summarize the Arizona Brewers season, I had to let you know how disappointing he's been. Lintz was drafted in the second round a year ago and hasn't thrown a good inning yet. He walked 38 in 40.1 innings and posted a 4.91 ERA in his second season with Arizona. He may head to Helena next year but his numbers don't warrant it. Biggest Surprise: Sean Halton - 1B - Halton was drafted in the 13th round this season. He started with Arizona and raked and was called up to Helena and continued to rake. Very Impressive. Biggest Disappointment: Cutter Dykstra - 2B - Dykstra started the year with Class A Wisconsin, playing Centerfield and stunk, then he went down to Helena to play second base and stunk. No progress made in his first full professional season.